New research from a peer review study indicates MYT is beneficial when working through Post Traumatic Stress. Results from a Mindful Yoga Therapy 12 week protocol used in the Newington, CT VA Hospital. Following are links to some research materials that support the empirically informed Mindful Yoga Therapy programs. Allen, M., et al. (2012 Oct 31). Cognitive-affective neural plasticity following active-controlled mindfulness intervention. Journal of Neuroscience. 32(44):15601-10. doi: 10.1523/JNEUROSCI.2957-12.2012. Chen, K.W., et al. (2012 Jul). Meditative therapies for reducing anxiety: A systematic review and meta-analysis of randomized controlled trials. Depression and Anxiety. 29(7): 545–562. doi: 10.1002/da.21964. Coeytaux, R .R., Principal Investigator (2014 Aug). Evidence map of yoga for high- impact conditions affecting veterans. Department of Veteran Affairs, Quality Enhancement Research Institute, Washington, D.C.
Emerson, D., et al. (2009 Nov). Trauma-Sensitive Yoga: Principles, Practice, and Research. International Journal of Yoga Therapy, (19): 123-128. Farb, N. et al. (2012 Feb). The mindful brain and emotion regulation in mood disorders. Canadian Journal of Psychiatry. 57(2): 70–77. Retrieved from http://www.ncbi.nlm.nih.gov/pmc/articles/PMC3303604/. Field, T. et al. (2012 Nov 26) Tai Chi/Yoga reduces prenatal depression, anxiety and sleep disturbances. Complementary Therapies in Clinical Practice. 19(1): 6-10. doi: 10.1016/j.ctcp.2012.10.001. Field, T. (2011). Yoga clinical research review. Complementary Therapies in Clinical Practice. 17, 1-8. doi: 10.1016/j.ctcp.2010.09.007. Hoge, E.A. et al. (2013 Aug). Randomized controlled trial of mindfulness meditation for generalized anxiety disorder: Effects on anxiety and stress reactivity. Journal of Clinical Psychiatry. 74(8): 786–792. doi: 10.4088/JCP.12m08083. Kearney, D.J., et al. (2012 Jan). 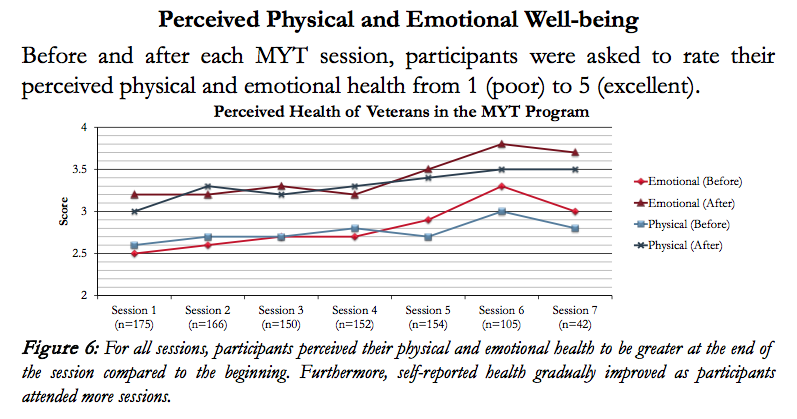 Association of participation in a mindfulness program with measures of PTSD, depression and quality of life of a veteran sample. Journal of Clinical Psychology. : 68(1): 101-16. doi: 10.1002/jclp.20853. Kerr, C. E. et al. (2013 Feb 13). Mindfulness starts with the body: Somatosensory attention and top-down modulation of cortical alpha rhythms in mindfulness meditation. Frontiers in Human Neuroscience. 7: 12. doi: 10.3389/fnhum.2013.00012. Kim, S.H. et al. (2013 Jun). Mind-body practices for post-traumatic stress disorder. Journal of Investigative Medicine. 61(5): 827–834. doi: 10.231/JIM.0b013e3182906862. McEwen, B & Seeman, T. (2009 Aug) Allostasis and Allostatic Load: Implications for Neuropsychopharmacology. Neuropsychopharmacology. 22, 108-124. Mitchell, K. S., et al. (2014 Apr). A pilot study of a randomized controlled trial of yoga as an intervention for PTSD symptoms in women. Journal of Traumatic Stress. 27(2):121-8. doi: 10.1002/jts.21903. National Center for Complementary and Alternative Medicine. Video: Scientific Results of Yoga for Health and Well-Being. Ross, A., & Thomas, S. (2010 Jan). The health benefits of yoga and exercise: a review of comparison studies. Journal of Alternative and Complementary Medicine. 16, 3-12. doi: 10.1089/acm.2009.0044. Seppälä, E. M. et al. (2014 Aug). Breathing-based meditation decreases post-traumatic stress disorder symptoms in U.S. military Veterans: A randomized controlled longitudinal study. Journal of Traumatic Stress. 27, 397-405. doi: 10.1002/jts.21936. Shelov, D.V., et al. (2009 Oct). A pilot study measuring the impact of yoga on the trait of mindfulness. Behavior Cognitive Psychotherapy. 37, 595-589. doi: 10.1017/S1352465809990361. Singleton, O. et al. (2014 Feb 18). Change in brainstem gray matter concentration following a mindfulness-based intervention is correlated with improvement in psychological well bing. Frontiers in Human Neuroscience. 8: 33. doi:10.3389/fnhum.2014.00033. Stankovic, L. (2011). Transforming Trauma: a qualitative feasibility study of integrative restoration (iRest) yoga on combat-related post-traumatic stress disorder. International Journal of Yoga Therapy. ; (21): 23-37. Stoller, CC et al. (2012 Jan-Feb). Effects of sensory-enhanced yoga on symptoms of combat stress in deployed military personnel. American Journal of Occupational Therapy. ; 66 (1): 59-68. doi:10.5014/ajot.2012.001230. Tang, Y.Y. and Posner, M.I. (2013 Jan). Tools of the trade: Theory and method in mindfulness neuroscience. Social Cognitive and Affective Neuroscience. 8(1): 118-120. doi: 10.1093/scan/nss112. van der Kolk, B. A., et al. (2014 Jun). 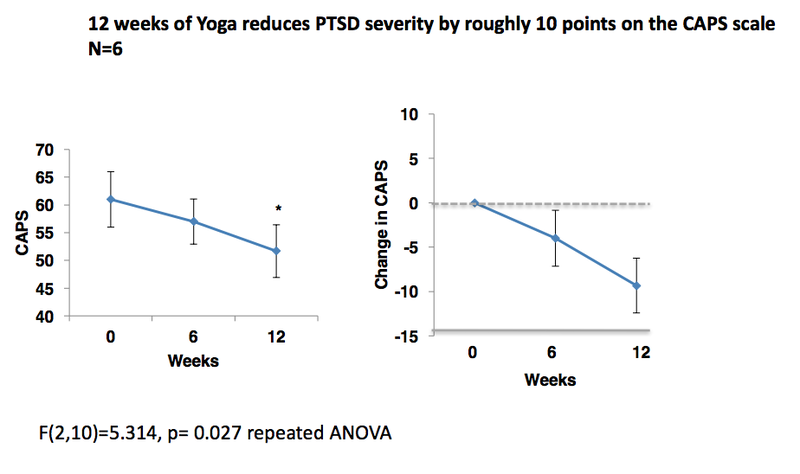 Yoga as an adjunctive treatment for posttraumatic stress disorder: A randomized controlled trial. Journal of Clinical Psychiatry, 75, 559-565. doi: 10.4088/JCP.13m08561.